Help promote safe and healthy communities! Watch for Red Ribbon celebrations at our schools and throughout our community! All of the students in Los Gatos public and private schools, Kindergarten through High School will celebrate Red Ribbon week. We have fun activities on campus this week to support healthy living styles for all students. 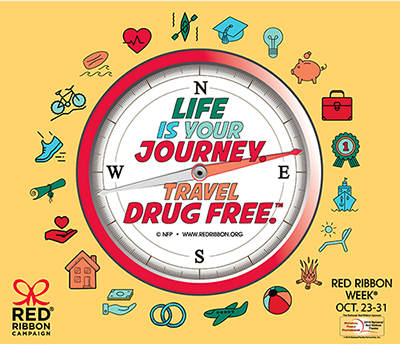 Red Ribbon Week is a national campaign against drug abuse which promotes education, prevention and healthy lifestyle choices that help young people to resist drugs and alcohol. Students who participate in activities centered on healthy lifestyle choices, and students wearing Red Ribbon Week wristbands receive discounts at participating businesses in the town of Los Gatos. Wristbands will be available at the office. Watch out for the flyers with details during the week!